I'm really enjoying reading with Mikko now. He's not yet to the stage where he'll sit still and listen the whole time, but we've at least moved beyond those board books with one picture and one word on each page to books with an actual story to them, and I'm thrilled. First of all, it's much less boring. Secondly, and more importantly, I'm getting to read all my old favorites again. We went to a small elementary-school book sale the other day. There were half a dozen tables with printed signs marking which was which — half of the signs decorated empty tables, because there simply weren't any books in that category, I guess. No matter — Mikko ripped down all the signs he passed, anyway. Oops. He was really fast about it. We just took them from him and laid them on top of the table instead, out of his grabby little reach. 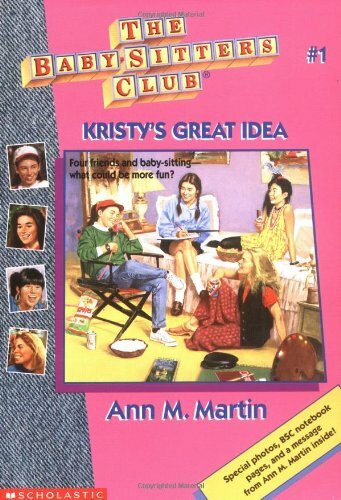 While Sam chased Mikko down the length of the hall, I combed through the haphazard stacks and piles of children's books, ignoring Baby-Sitters Club (though I have fond memories! )* and other older-kid fare, anything we already had, anything preachy, anything boooring, and anything that looked like it had been in the clutches of a child even more destructive than Mikko. We still ended up with a nice big stack that included — do you remember? 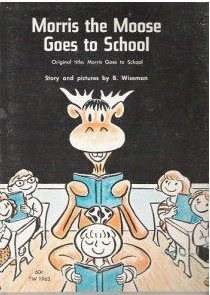 — Morris the Moose Goes to School . I wondered if it really is a good book or if I just remembered it as one, so I read it with some trepidation last night. It really is good! Bonus: It's an old library copy, and Mikko is as fascinated with the old-school checkout-card envelope pasted inside the cover as I am. I also snagged Danny and the Dinosaur , even though I couldn't remember the plot, for the same reason of vague fondness. 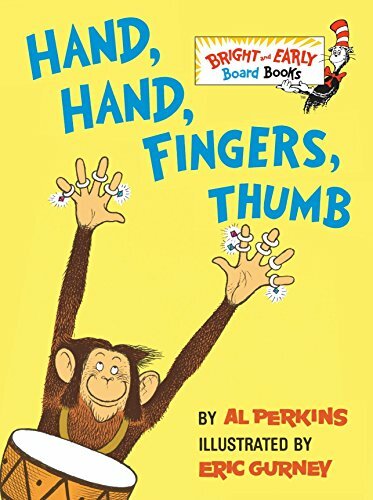 One of Sam's favorites as a kid was Hand, Hand, Fingers, Thumb , which is a rhythmic story about monkeys drumming and a treat to read aloud. Today we were at our Bible study at a café and I was trying to distract Mikko from pulling me away from the group. I rummaged through the diaper backpack o' fun and pulled out Hand, Hand, Fingers, Thumb, which I'd forgotten was tucked away in there. I wondered if Mikko would remember it from last time and be intrigued. Well, he started hitting me. I persisted in reading, wondering what he was up to. I looked up and saw that he was grinning, and I realized the hitting was rhythmic and flat-handed. My little monkey, enjoying the books we love. What are your favorites? 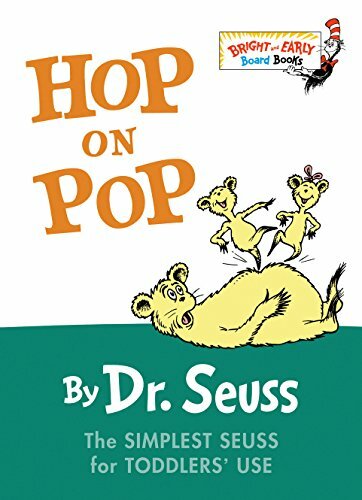 What are your kids' favorites? 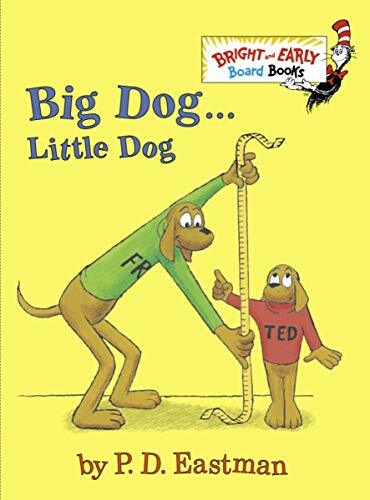 I'll take recommendations and reminders of what wonderful children's books are out there. 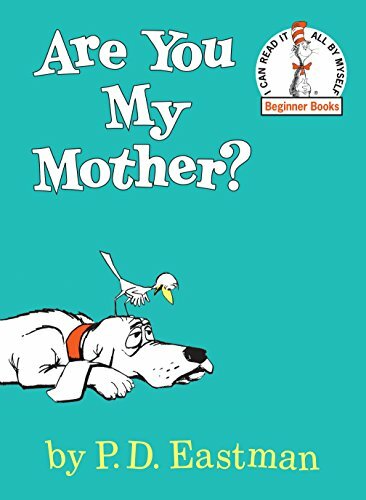 I never really did leave children's books behind, but I'm loving my very good excuse to dive into them again. Thanks for the recommendations. I haven't heard of some of those books...and we are always looking for new ones. Some of our favorites (I have a three year old, but she liked these at least a year ago) are Chicka Chicka Boom Boom, Fluffy: Scourge of The Seas, Llama Llama Red Pajama, Go Away Big Green Monster, and Mommies say Shhh. Those are just a few that I can think of off the top of my head. 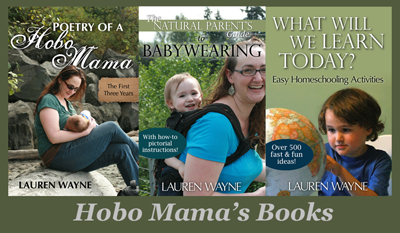 I agree that reading becomes a fun family activity once the little ones become a little more interested in the stories. I'm excited to get the drumming book that you mentioned on our next trip to the library. Thanks! Oh, those are all going on my library list! Thanks for the recommendations. We were actually able to read Chicka Chicka Boom Boom at the library because it was sitting out on display, but I forgot about it till you reminded me — very fun to read aloud!